The image shows the deck layout of Thales conventional take-off and landing (CTOL) design. The integration of an electromagnetic aircraft launch system (EMALS) will be considered for the CVF as the technology matures. A nuclear powered CVF with combined CTOL run on the port side and STOVL run on the starboard side of the carrier. A decision was taken not to use nuclear powered propulsion due to the higher cost. The STOVL variant shows a single island being considered in 1999. Later designs have replaced the single island with a forward ship control island and an aft flight control island. A conventional CTOL variant being studied by BAE in 2001. The two-island STOVL variant proposed by the Alliance industry team. The 70t-load deck-edge aircraft lift between the islands is in the lowered position. An AMS S1850 3D air search radar is mounted on the forward island. A BAE Sampson targeting radar is on the aft FLYCO island. A crane for lifting downed aircraft is installed to the starboard side of the FLYCO island. The STOVL variant proposed by the Alliance Team shows the two smaller islands instead of a larger single island. The bridge is on the forward island. The aft island is the flight control (FLYCO) island. The choice of the STOVL variant of the F-35 fighter means the carrier will not be initially configured for conventional landings. A STOVL design proposed by Thales. Thales SMART-L radar is mounted on the forward island on the left and Thales APAR targeting radar on the aft FLYCO island. UK CVF Royal Navy aircraft carriers, HMS Queen Elizabeth and HMS Prince of Wales, are expected to enter service in 2017 and 2018 respectively. The aircraft carrier was officially christened by The Queen in July 2014. Billions have been ploughed by the US and UK governments to ensure that they continue their claim to possess the most advanced navies in the world. HMS Queen Elizabeth left Rosyth for her maiden sea trials, hitting a significant milestone in her delivery to the Royal Navy. CVF will displace 65,000t, a size between the USA’s 100,000t Nimitz Class and the French 43,000t Charles de Gaulle Class aircraft carriers, and three times larger than the 20,000t UK Invincible Class carriers. The carrier will have a maximum speed of 25kt. At 15kt the range is 10,000nm and the ship carries food, fuel and stores for an endurance of seven days between replenishments. Each ship will have a complement of typically 1,200, including 600 aircrew. The CVF Integrated Project Team is managing the procurement programme on behalf of the Ministry of Defence Procurement Executive. On 7 July 2009, construction of the carriers began, with the first steel being cut in Govan at the BVT shipyard. "CVF carriers HMS Queen Elizabeth and HMS Prince of Wales, are expected to enter service in 2016 and 2018." In January 2003 the Ministry of Defence announced that the preferred prime contractor for the UK future aircraft carrier is BAE Systems with Thales UK as the key supplier. The industrial partnership between BAE Systems and Thales UK is known as the Future Carrier Alliance. In February 2005, Kellogg, Brown & Root UK (KBR) was appointed as preferred ‘physical integrator’ for the project and was responsible for developing the optimum manufacturing strategy. VT Group and Babcock have also joined the alliance. In December 2005, the UK MoD approved funding of the demonstration phase for detailed design of the carriers, the first part of the main gate decision. The second part, approval for construction, is expected by the end of 2006. It was also announced that 60% of the carriers would be built at four UK shipyards – BAE Systems Govan (hull block 4) and Barrow (block 3), BVT Portsmouth (block 2) and Babcock Appledore and Rosyth (bow block 1). Babcock will be responsible for final integration. In 2009, a few changes were made to the production strategy. The stern sections of lower blocks 3 and 4 will be built at BVT Clyde while the sponsons will be built at Babcock Marine, as per the new strategy, which the alliance approved on 2 March 2009. In April 2006, contracts were placed with Alliance members KBR, BAE Systems Naval Ships, Thales UK, VT Group, Babcock and BAE Systems Insyte, for the demonstration phase design contracts. 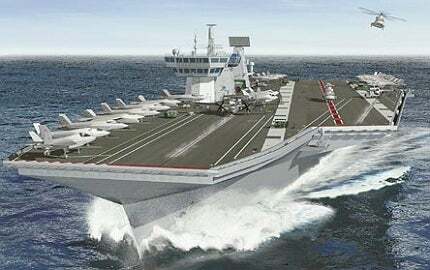 In July 2007, the UK MoD announced main gate approval for the construction of the carriers. At the same time BAE Systems and VT Group announced the planned creation of a joint venture for the design, manufacture and support of UK surface warships. The joint venture company, called BVT Surface Fleet Ltd, began operations on 1 July 2008. This was followed on 3 July 2008 by the UK MoD signing the contracts for the two carriers with BVT and other members of the alliance. First metal was cut at Babcock’s Rosyth yard in 2009. In March 2008, Brand-Rex Limited of Scotland was contracted to provide blown-fibre-optic cable plant (BFOCP) technology. Installation and project management services for the £3m-plus contract are being provided by Alfred-McAlpine – IT Services. Fluid Transfer International won the £4m contract to install aviation fuel systems equipment. Salt Separation Services was chosen to provide reverse osmosis equipment, in a contract worth more than £1m. The equipment will provide 500t of fresh water on a daily basis for the personnel on board. In December 2008, the UK MoD announced that the originally planned in-service dates of the carriers, 2014 and 2016, would be set back by about two years (2016 and 2018) to match the entry into service of the joint combat aircraft, the F-35B. In January 2009, VT Group announced its intention to sell its holding in the BVT Surface Fleet joint venture to BAE Systems, following UK MoD approval. KBR, having completed their contribution, will not be part of the alliance for the manufacture phase. In February 2008, Babcock was awarded a £35m contract for the dockyard modifications required. A ‘Goliath’ crane is to be purchased, which will be the largest crane in the UK. "CVF holds food, fuel and stores for an endurance of seven days between replenishments." Major contractors include BAE Systems – prime contractor; Thales Naval Ltd – key supplier; BAE Systems Insyte (formerly Alenia Marconi Systems) – C4IS; BMT Defence Systems – naval architecture; EDS – systems integration, fleet support, through life support; Lockheed Martin – programme management and engineering; QinetiQ – computer modelling and simulation, technology, test and evaluation; Rolls-Royce – propulsion, life support; Strachan & Henshaw – waste management, munitions handling; Swan Hunter – construction; VT Group – naval architecture, construction, through life support. In December 2005, following discussions between the UK and French Governments on the possibility of cooperation with the design of the next French carrier, the PA2, it was agreed that France would pay one-third of the costs of the demonstration phase of a common baseline design of CVF. A memorandum of understanding to that effect was signed by the two nations in March 2006. The French plans for the PA2 have since been put on hold and a decision is not now planned until 2011. The industrial partnership between BAE Systems and Thales UK is known as the Future Carrier Alliance. The Maritime Group at QinetiQ have developed a suite of advanced modelling and simulation programmes that are being used by the QinetiQ and DPA teams with BAE Systems and the major contractors to characterise the hull, flight deck, hangar deck, internal carrier design and other features. The hull designs are being planned for a 50-year service life and are currently being configured with a ski ramp for short take-off and vertical landing (STOVL) operations. The carrier’s service life is substantially longer than the 20-year service life of the selected F-35 STOVL carrier aircraft. The DPA has decided the carriers will be upgradeable to a conventional take-off and landing (CTOL) design, so the option will be available to operate conventional maritime aircraft. The hull will be nine-decks deep plus the flight deck. Corus will supply the more than 80,000t of steel plating required for the two ships at an estimated value of £65m. A number of protective measures, such as side armour and armoured bulkheads proposed by industrial bid teams, have been deleted from the design in order to comply with cost limitations. "The CVF is three times larger than the 20,000t UK Invincible Class carriers." The carrier will support joint combat aircraft carrying out up to 420 sorties over five days and be able to conduct day and night time operations. The maximum sortie rate is 110 joint combat aircraft sorties in a 24-hour period. The standard airgroup of 40 aircraft includes the Lockheed Martin F-35B joint strike fighter, the EH101 Merlin helicopter and the maritime surveillance and control aircraft (MASC). The maximum launch rate is 24 aircraft in 15 minutes and the maximum recovery rate is 24 aircraft in 24 minutes. The MASC assessment phase for an airborne early warning aircraft to succeed the Sea King ASaC mk7 helicopter was launched in September 2005. In May 2006, three study contracts were awarded for MASC platform and mission systems options. The contracts were awarded to: Lockheed Martin UK to study the potential of using the Merlin with AEW mission systems, AgustaWestland to study maintaining the Sea King ASaC mk7 to 2017 and Thales UK to study upgrading the Sea King’s mission systems. In July 2006, two further study contracts for the enhanced manned rotary-wing solution were awarded to EADS Defence & Security Systems UK and Northrop Grumman Integrated Systems. Funding for the MASC programme has been deferred and it appears likely that the Sea King ASaC mk7, with capability upgrades, will be retained until the helicopter’s out-of-service date of 2022. The aircraft carriers hanger deck, 155m x 33.5m x 6.7m to 10m high, accommodates up to 20 fixed and rotary wing aircraft. Under contracts placed in September 2008, Babcock will supply the highly mechanised weapons handling system (HMWHS) and BAE Systems Insyte the air traffic control system for the two vessels. Instead of a traditional single island, a current ship design has two smaller islands. The forward island is for ship control functions and the aft (FLYCO) island is for flying control. Advantages of the two island configuration are increased flight deck area, reduced air turbulence over the flight deck and increased flexibility of space allocation in the lower decks. The flight control centre in the aft island is in the optimum position for control of the critical aircraft approach and deck landings. "Two large 70t-load deck-edge aircraft lifts transfer aircraft between the hangar and flight decks of the CVF." Depending on budget availability, the radar fit will include a BAE Systems Insyte Sampson multi-function radar on the forward island and an Insyte S1850M air surveillance radar on the aft FLYCO island. The S1850M air surveillance radar, operating at 1GHz to 2GHz, is an electronically stabilised multibeam radar, operating up to an elevation of 0° to 70° and providing automatic target detection and tracking to a range of 400km. The Sampson multifunction radar includes two phased array antennae planes which are rotated and which scan electronically in azimuth and in elevation to provide 360° coverage. The four-sided pyramidal masthead with a spherical low-loss glass-fibre-reinforced plastic radome gives the Sampson radar its distinctive appearance. The deck will support simultaneous launch and recovery operations. The deck is fitted with a 13° bow deck ski jump. No catapult or arresters will be fitted in the initial build but the carrier will be built to accommodate a future back-fit. The carrier will be fitted with a steam catapult or electromagnetic launch system and arrester gear, if the option to convert the carrier to the conventional take-off and landing (CTOL) variant proceeds. The deck has three runways: two shorter runways of approximately 160m for the STOVL joint strike fighter and a long runway, approximately 260m over the full length of the carrier, for launching heavily loaded aircraft – an area of nearly 13,000m². The deck will have one or two vertical landing pads for the F-35 aircraft towards the stern of the ship. Jet blast deflectors will be fitted on each runway 160m back from the bow ski jump and probably in line with the rear wall of the first island. The deflectors protect the deck from the blast of the F-35 joint strike fighter aircraft engines operating at maximum thrust for take-off. There will be two large 70t-load deck-edge aircraft lifts, to be built by McTaggart Scott of Loanhead, Scotland, to transfer aircraft between the hangar and flight decks, one between the islands and one to the aft of the FLYCO island. QinetiQ and the US Navy carried out a study on an electromagnetic catapult launcher. Early studies indicated that a 300ft-long, 90MW linear motor would be needed for the CVF aircraft carriers, but both MOD and UK industry would wish to see the results of demonstrations and trials of electromagnetic launcher technology before considering the selection of a launch system. 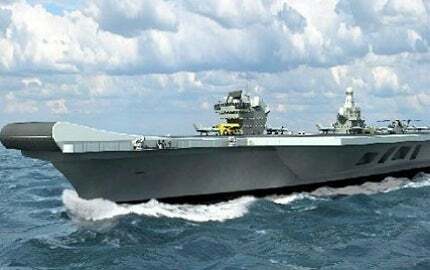 An electromagnetic aircraft launch system (EMALS) is to be developed by General Atomics in USA for the USN CVN-21 aircraft carrier. The maturity of EMALS technology for integration into UK CVF aircraft carriers will be assessed as the US CVN-21 programme progresses. "The Royal Navy’s CVF aircraft carriers are expected to displace between 55,000t and 65,000t." The carrier might be built for but not with the installation of a close in weapons system. Another systems which could be fitted if budget were made available would be two 16-cell vertical launchers for the Aster missiles. Selex Communications was awarded the production contract for the vessels’ identification friend or foe (IFF) systems in October 2007. The Queen Elizabeth Class will be fitted with the Royal Navy’s new-generation maritime medium-range radar (MRR) to replace the type 996 surveillance and target indication radar. In August 2008, BAE Systems Insyte (with Qinetiq) ARTISAN 3D E/F-band radar was selected for the MRR. The MoD has decided not to use nuclear propulsion because of its high cost, and has chosen an podded propulsion system based on Rolls-Royce’s integrated electric propulsion (IEP) system. The contract for the propulsion system was placed in October 2008. The propulsion system will consist of two Rolls-Royce Marine 36MW MT30 gas turbine alternators, providing over 70MW and four diesel engines providing approximately 40MW, with the total installed power approaching 110MW. The gas turbines and diesels are the largest supplied to the Royal Navy, their combined power feeds the low-voltage system and supplies two tandem electric propulsion motors that drive a conventional twin shaft arrangement, fitted with fixed-pitch propellers. In December 2007, the UK MoD placed a contract with Wärtsilä Defence for two 12-cylinder and two 16-cylinder Wärtsilä 38 diesel engines for the IEP of each ship. L-3 Communications is supplying the integrated platform management system and Converteam the high voltage system and propulsion converters / motors. CVF will have two bronze propellers, each 6.7m in diameter and weighing 33t. The anchors will be 3.1m in height and weigh 13t. CVF will carry over 8,600t of fuel to support both the vessel and aircraft.